COWES HAMMERHEAD CRANE TO BE 'DE-RISKED' ? In 2008 English Heritage included the hammerhead crane on their 'Buildings at Risk' register. Since then there has been growing concern that no remedial work has been forthcoming. The council are now seeking a grant from English Heritage in order to issue an Urgent Works Notice so some work can be done towards taking the crane out of its 'at risk' status. The last planning application for a major development covering the site foundered in 2005. Since then the crane has been an integral part of renewed pre-planning discussions between the developer and council. Any new planning application will have to include the crane in place, and its complete refurbishment will be necessary to match the aesthetics of new surroundings. Unfortunately nobody knows if and when the planning application will come to fruition and what effect any further delay will have on an idle crane. The present situation arose when the crane was surveyed by English Heritage and identified as needing urgent repairs. One major concern is the condition of the ballast box. Normally the owner of a listed structure is held responsible for such repairs. In this case the developer refused to pay for the work, on grounds of questionable ownership of the crane arising out of complexities surrounding acquisition of the site. This led to a situation where English Heritage were pressuring the council to pursue the developer to repair a crane he claimed he didn't own. There was the additional problem that the only other option for the council was enforcement against a developer they were negotiating with on wider planning aspects. The council are now going to issue an Urgent Works Notice to implement immediate requirements. An Urgent Works Notice is served under the Planning Act and can be applied to a vacant listed building where works are urgently necessary for preservation. Upon completion of the works, notice may be served on the owner requiring repayment of the costs incurred. Strictly speaking the issue of development has no relevance to the preservation of the Grade II* listed crane, but in practice it's long term conservation is inextricably linked. There are probably many difficulties surrounding the development, not least the additional planning requirements now determined by anticipated rising sea levels and flood defences. Nevertheless it's in everybody's interest that the development goes ahead, including supporters of the crane. Up until the Second World War the Island provided a high degree of self sufficiency in the provision of building materials. This brick kiln is the only intact example that remains of the numerous brick, cement and lime kilns that produced the materials of which a great number of Island properties are constructed. 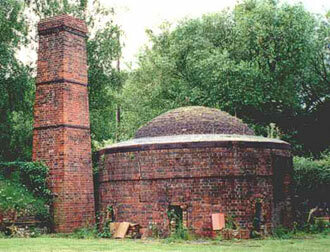 The kiln has been well looked after and sits in private grounds near Cowes. These grounds were once part of the Hillis Brickworks, established in the early 1900s by William Pritchett. It ran for around fifty years, during which time it underwent a number of developments, one of the last of which was the inclusion of the existing kiln. William Pritchett came from a family of brickmakers who originated in the New Forest and arrived here in the late 18th century. Over the years they developed a string of brickworks across the Island, including the Rookley site that became the last of the Island's working brickyards. English Heritage inevitably apply a more stringent criteria in listing 20th century structures, and less than two percent of Island listings date from that period. The Hillis kiln has been accepted for protection on the basis of its national importance as an excellent example of the downdraft type. It was also considered as having architectural merit, irrespective of function. Downdraft kilns were devised as an alternative to the Scotch or Suffolk updraft kilns where bricks were fired over rising heat. In the downdraft system the heat entered from fireholes at the side and the rising hot gases were drawn up, over and down through the kiln, then out through a perforated floor containing the flue. This provided a more even firing and fewer waste bricks. Bricks could be fired in about one day on full heat but additional time taken in loading, curing, raising temperature, cooling and unloading generally resulted in a fourteen day operation. The downdraft kiln also afforded the efficient production of quality terracotta garden ornaments and containers. The Victorian period had seen an increasing interest in the domestic garden and by the turn of the century garden products were becoming good business for brickmakers. The Pritchett family were one of the Island's leading manufacturers in this market. The Hillis kiln may have been as much a pottery kiln as it was a brick kiln. There will never be certainty as to why the Isle of Wight was so named because it arose before recorded language, Latinised by the Romans and resurrected by the Anglo-Saxons. The most widely accepted theory of its derivation assumes Celtic origins. A new research paper has now challenged this view, claiming the origin is more likely to be Germanic, providing a different meaning. The traditional explanation for the name "Wight" interprets the word as an old Celtic term, translated as "separated from" or "place of division". However, a new theory proposes a derivation from a rival early proto-Germanic language, having the sense of "lively little companion" or "sprite" i.e. a smaller version of a larger entity. This theory proposes that the dividing line between this early proto-Germanic language and proto-Celtic language was not the North Sea, but roughly through the middle of Britain. The proto-Germanic language supplies a word "wextiz", that is a very good match for Vectis, especially when one bears in mind the fact that Latin pronounced W like our V and had no guttural x (a guttural consonant often written gh or ch). The resulting Latin word Vectis represents the solution the Romans would have worked out to write "wextiz". Proto-Celtic does provide the word "wexta" but no appropriate meaning can be found that fits Isle of Wight, so previous commentators concluded the word was influenced by the Latin "vectis" (lever) and veered towards the 'parting of waters' idea, with its sense of being divorced or separated from the Mainland. Amongst the Jutes/Saxons that settled on the Island the original word Wextiz developed into Wiht. Despite difficulties in defining the word "wextiz", it can be identified by finding parallels in other languages for the earliest spelling of Wight, which tended to be "Wiht". Modern German has Wicht meaning dwarf or imp while Dutch translates Wicht as babe, infant i.e. a very young child (birth to 1 year) who has not yet begun to walk or talk. Nordic languages provide the word vaet (plural, vaettr) meaning "sprite". Consequently this new idea postulates that Wight has the sense of sprite or little companion, and, in meaning, suggests a small version of its larger parent. The paper was prepared by Anthony Durham and is expected to be published shortly. It represents the first serious research into the subject for many years.